Crossroads Reparatory Theatre will resurrect one of the most acclaimed plays of the last 20 years with its production of "The Lonesome West". Opening July 8, "The Lonesome West" was written by contemporary Irish playwright Martin McDonagh and set on the west coast of Ireland. 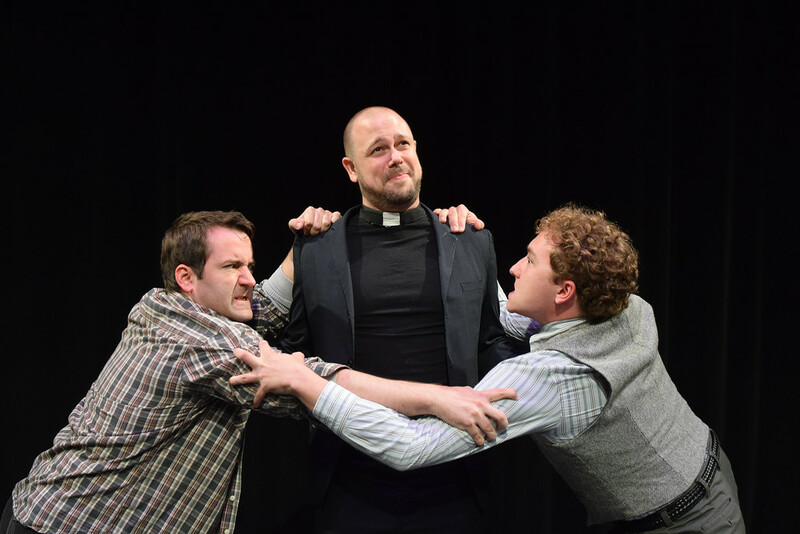 This biting comedy follows brothers Valene and Coleman as they squabble over money following their father's wake, leaving parish priest Father Welsh with the duty to set things straight - or not? "This is a wonderful story about a community that's told in a rather dark way, but despite that darkness it's incredibly funny," said Chris Berchild, the play's director and chair of Indiana State University's department of theater who has been involved with Crossroads Rep productions since 2003. "I've been wanting to do this play since it first premiered in the 90s and this year seemed like a good time to do it." Filled with elements of the original show, the Crossroads production stays true to the mood, energy and humor of the original writing but offers an American audience a hook into the piece. For Berchild, that hook was the production's "brutal honesty". "This play doesn't sugarcoat anything," he said. "I love the fact that some of the things that occur are somewhat over top and absurd allowing you to look at the characters in funny way but don't let them slide for their mistakes." Ally Miles plays Girleen Kelleher, the lone female character and local moonshine dealer who, like everyone in Leenane, has a secret. On top of memorizing her lines and blocking, Miles also had to master using an Irish dialect in order to create a well-rounded character. "It has been pretty surreal being in this play because I have been watching plays at Crossroads Repertory Theatre for years now," said Miles, a Terre Haute native. "Having the opportunity to work alongside actors I have admired for a long time is a dream come true and getting Chris Berchild as a director is a huge blessing because he has the patience and the insights that will really allow me grow as a professional, as this is still a learning environment for me." Since the production's first read-through on May 26 followed by a first blocking rehearsal on June 1, Miles has been shocked to realize that performing isn't the frightful experience she had expected. "Coming into this summer, I was worried about being perfect at everything when we first started work on the production, but I couldn't have been more wrong," she said. "Even in the professional world, it is okay to let your skills build up, rather than starting out flawlessly because that is not plausible, although my cast mates could probably prove otherwise. I have quite the ways to go, but I know that this experience will strengthen me in infinite ways." "The Lonesome West" runs at 7 p.m. July 8, 9, 14 and 20 and at 4 p.m. July 10 in Indiana State's New Theater, 540 N. 7th St. Single-production tickets are available for $20. Opening July 8, “The Lonesome West” was written by contemporary Irish playwright Martin McDonagh and set on the west coast of Ireland. The play runs runs at 7 p.m. July 8, 9, 14 and 20 and at 4 p.m. July 10 in Indiana State’s New Theater, 540 N. 7th St.